Let's talk about down payments. When most Americans buy homes, they don't pay cash for the entire home upfront. Instead, they buy the home by taking out a special type of loan called a mortgage. Homeowners generally pay for the mortgage in monthly installments over the course of 30 years. But you usually can't take out a mortgage for 100% of the cost of a home. Lenders want to see that homebuyers have “skin in the game,” or money you stand to lose if you don’t pay your mortgage. You have to put in some cash for the home upfront, which is called a down payment. A down payment can be a major roadblock for a lot of Americans who want to buy a home. In simple terms, your mortgage is equal to the total cost of your home, minus the amount you put down. For example, if you put 10% of the cost of the home as a down payment, then your mortgage would be for the remaining 90% of the cost of the home. This is known as a 90% mortgage. How much money do you usually have to put down? The mortgage industry is primarily structured around providing 80% mortgages, which are generally perceived by lenders to be less risky than larger mortgages. Why is a 20% down payment important? When you put less than 20% down, most lenders require you to buy private mortgage insurance (PMI), which is expensive. It can cost a few hundred dollars a month. Some lenders don’t require PMI but instead charge a higher interest rate if you put less than 20% down, which can also be very expensive. When you put 20% down, compared to putting 10% down, you make smaller monthly payments because you've taken out less debt. That means that putting 20% down gives you a lot more homebuying options. With the same monthly payments, you can afford more house with 20% down compared to putting just 10% down. 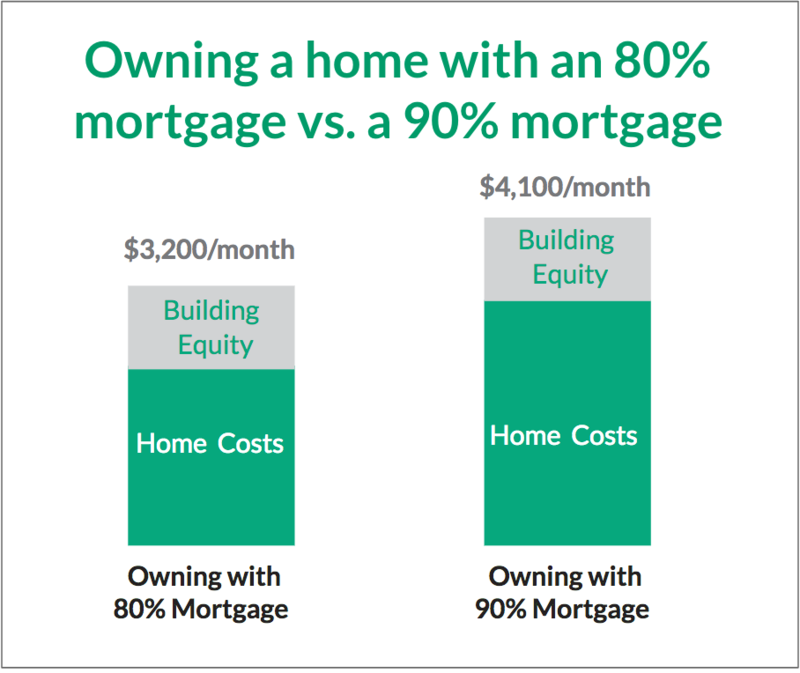 Let's imagine you wanted to buy a $600,000 home and compare the monthly costs if you were to buy a home with an 80% mortgage or buy the same home with a 90% mortgage. This graph is for illustrative purposes only. On a monthly basis, there is a big differential between the monthly payments on an 80% mortgage versus a 90% mortgage. Working with Landed, homebuyers can enjoy the benefits of a 20% down payment without increasing your monthly payments! If you want to learn more, feel free to email us at hi@landed.com. The above article is intended to provide generalized information. It does not give tax, investment, legal, or other advice. Before taking any action, you should always seek the assistance of a professional.